As an English teacher, I avoid math. The only time I “do” math is when I multiply Charlie’s original IQ of 68 in the novella, Flowers for Algernon, by three on the white board to show that Charlie’s IQ was surgically increased to 204. When I successfully manage the multiplication, my class goes wild. Cheers ring through the room. I’ve been thinking a lot about percentages lately. In real relationships, it is never 50/50 in regard to give and take. But, in a healthy relationship, it should balance out. With the dogs, their portions of food are not equal. That is not because I love Gus less, it is simply because he is the smallest. Faith receives the most food because she is 90-pounds. Booker has a smaller portion for his 26-pound body. And, finally, weighing in at 16-pounds, Gus gets the smallest. It is a bit like Goldilocks. 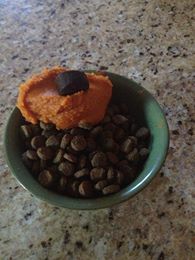 The portions, including pumpkin and yogurt are “just right” for each dog. Back to relationships . . . I own my part. My romantic relationships have fallen apart because of infidelity, rigidness, and me playing the “fixer-upper.” In each relationship, I know I share a percentage of the blame for its disintegration. I also claim my part in the success of my romantic relationships. I am compassionate, warm, giving, and thoughtful. Again, with a relationship, friendship, or feeding the dogs, there is a balance. It is not always equal. But, in the end, everyone gets what he or she need and it equals out.